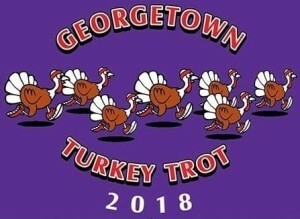 Welcome and thank you for supporting the 6th Annual Georgetown Turkey Trot 5 mile run and 1 mile walk, both start at 8am. The Georgetown Running Club and Sertoma are hosting this event. Proceeds will be shared between the Williamson County Meals on Wheels and Friends of Georgetown Parks and Recreation (Park Pals). We will also be collecting nonperishable food for The Caring Place on race day (look for their truck to drop off the donations). We still need volunteers… visit our sign-up link for the details. 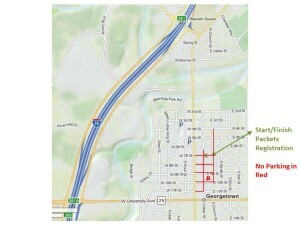 The 5 mile run and 1 mile walk courses will start & finish in downtown Georgetown (near 7th & Main). The 5 MILE RUN has the same course as last year. It is important that you turn right on 11th St and not left on 11th St on the 1 Mile walk course. 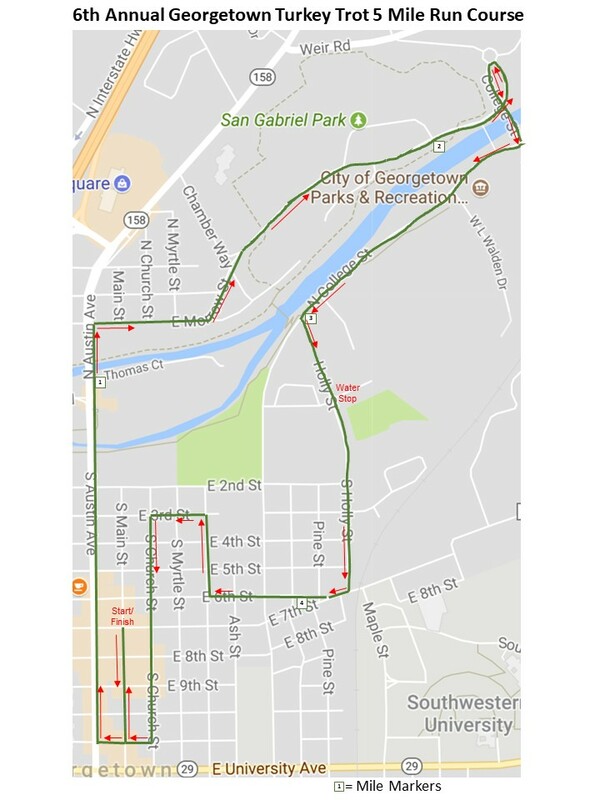 The course heads up Main St with a right turn on 11th St and then cruises down Austin Ave (STAY in the curb lane) with great views of the San Gabriel River, into San Gabriel Park (E. Morrow Ave). 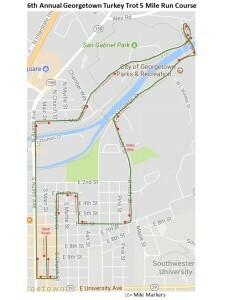 During this part of the course you will be directed over to the left side of Morrow Ave. You will go under the bridge and up, around, and across the bridge to College Ave. Stay to your left on College Ave, left on Holly St (running on the right side of the road) and turning on 7th and then immediately on 6h. Enjoy your run through historic Georgetown, as you run along the right side of 6th St to a right on Elm St, left on 3rd St, left on Church St, right on 11th St and then the final 4 blocks down Main St to the finish line. There will be a water stop on the 5 mile run course at the entrance to the Dog Park. The 1 MILE WALK is an out-and-back from 7th & Main up Main St, left turn on 11th St, left turn on Church St and turnaround before 7th St. 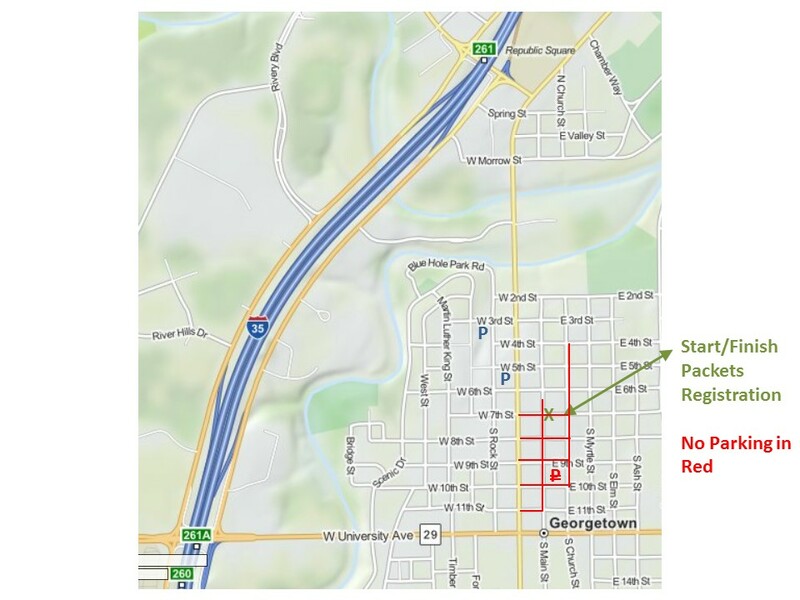 Very important that you line up on the left side of the Main St at the starting line as you will be turning left on 11th St as the 5 Mile runners turn right on 11th St. As you go north on Church St please stay to your right and at the turnaround stay to the left back up to 11th St. Right on 11th St and then right on Main St and the final 4 blocks to the finish. Water, AdvoCare electrolyte replacement, and refreshments will be provided after the race. Both courses are stroller and walker friendly, but please start behind the runners. Dogs must keep their owners on a leash. This is for children only, but parents and family may run with the child of course. The course is an out and back. $5 donation to The Caring Place. All children will receive a finisher’s ribbon and shirts while they last. VERY critical, do not park on Main St (between 7th & 11th Streets), Church St (between 4th & 10th Streets), or the parking lot between Main, Church, 9th, and 10th Streets). 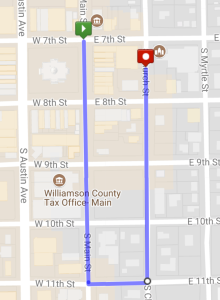 There are plenty of free city parking lots and parking spots on various streets, especially West of Austin Ave. See the link at ww.NoExcusesRunning.com for downtown Georgetown for best place to park and map to Georgetown. Remember to only park in legal spots. Careful crossing Austin Ave to get to the Georgetown square. Guaranteed Tech shirt for entries received by 11/4. Those that registered after 11/4 are while supplies last. This allows for more money to the charities and not into leftover shirts. If you didn’t get a shirt, check back after you finish the Turkey Trot, any shirts not claimed will be given to those that didn’t receive a shirt. We will not be holding shirts after race day pick-up. Thank you for your understanding. Even if you have a guaranteed shirt, it is very helpful to have them picked up on Wed because it will be very crowded on race morning. Race bibs should be worn on the front of every participant. It is crucial for distributing awards. You will notice they are color coded and this helps us with the awards. We have decided to make this an untimed event. However, Data Event Solutions has donated a digital timing clock that will be at the finish. By not paying for a timing company we will be able to provide hot meals to an adult for an entire year. Thank you for your understanding. 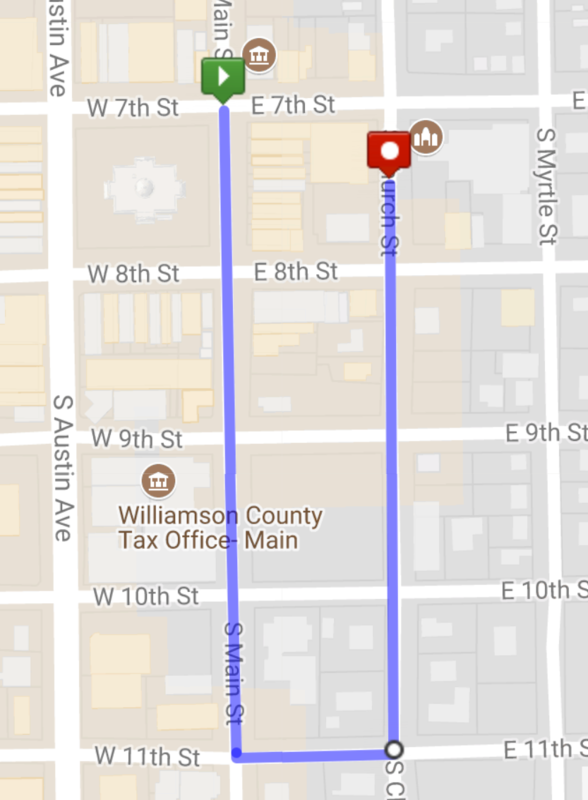 Best parking spots are any street parking and lots between 9th & 5th street WEST of Austin Ave. Parking east of Austin Ave might get your car blocked in. Awards presented to top overall male and female runners, overall masters male and female runners, and age category winners. No duplication of awards. Awards will be distributed at the finish line. Big thanks to the Turkey Trot’s Gold sponsors Walker Plumbing Company and AdvoCare. Other sponsors include Data Event Solutions. Thank you again for your support of this event.